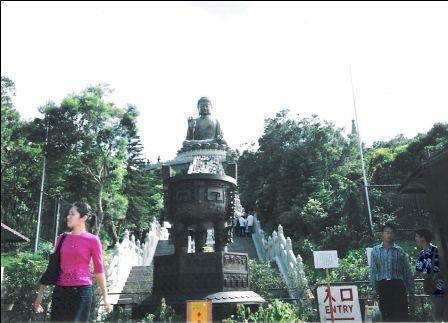 We went to visit the Hong Kong Giant Buddha in the year of 2000 and 2012. It was a HUGE difference, especially the visitors and the size of the surrounding area. I will show you the differences now and then. You will be the one to decide which one you would like better although none of us can go back to the good old days. Back then, the new airport was still under construction. So, Lantau Island was not as crowded as today. (The bus stopped by the housing estates. When we passed by those housing estates in 2009, the scale has expanded at least 10 times compared to what we saw in 2000) Of course, transportation was not as convenient either. Here, I will share with you our experience back then. We hope that this will give you some insight of the development of Hong Kong. 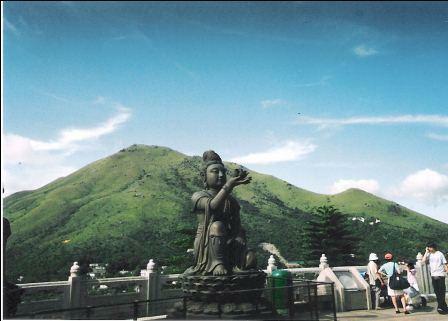 Nowadays, you can go to the Buddha not only by bus, but also by the cable car, called Ngong Ping 360 which is one of the scenic spots to check out. When we went back in 2007, there was a technical problem which had it closed for the public. So, we couldn't get on. 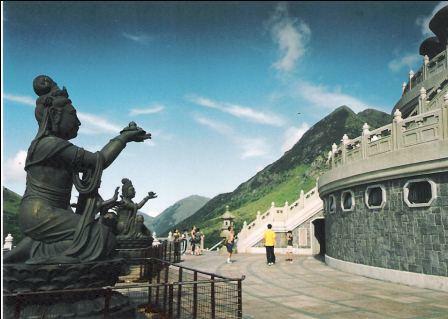 To get to the Buddha, we got on bus 23 from Tung Chung Town Centre. The day we went was very hot and made the bus trip seem to last forever. (Back then, not all the buses had air-conditioning.) The road going uphill was super narrow. There was no way to have 2 cars to pass by each other. There were several times that our bus had to stop in order to let the bus coming from the opposite direction to go by before our bus could move forward. But I got to admit that the scene we passed by while we were in the bus was awesome. 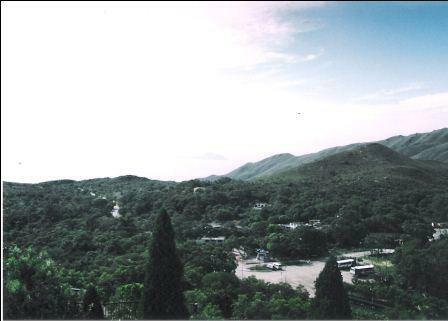 I believe that that is the scene that you could see if you take the cable car at Ngong Ping 360. Unlike the harbour view if you take the Star Ferry Tour, you can see the harbour where it is not crowded with ships. It looked very peaceful. Also, without pollution, the blue sky, small green islands and dark blue sea made for a very gorgeous picture. We finally arrived at the top of the hill. 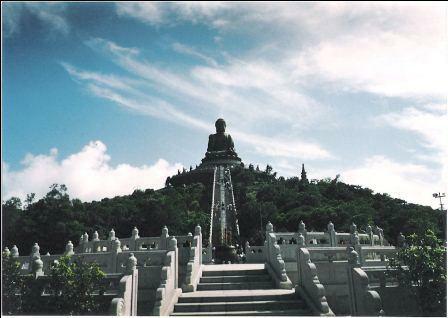 Raise your head, you will see the Hong Kong Giant Buddha way up there. To go to see it real close, you must climb up that long staircase. There are 268 step. In the summer time it may be a bit difficult, especially with the weather in Hong Kong. But take your time. It is worth it in the end. It takes about 10-15 minutes to get to the top of the staircase. 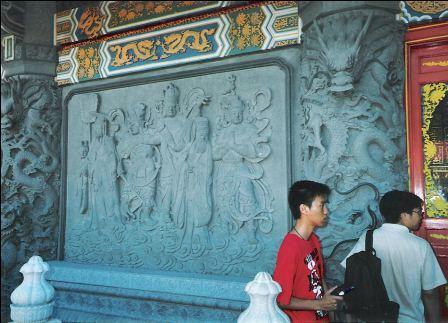 Other than the Giant Buddha itself, there are other statues surrounding it. 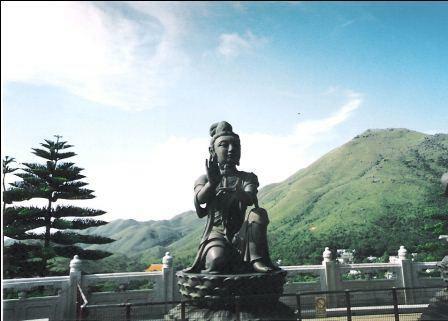 There are several statues surrounding the Hong Kong Giant Buddha. Each of them has a different gesture and different stuff in their hands. See the differences among the last 3 statues? 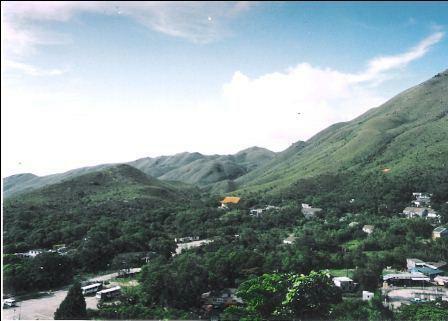 The above 2 pictures show the view looking down to the valley from the Hong Kong Giant Buddha. You can see where the bus station is. 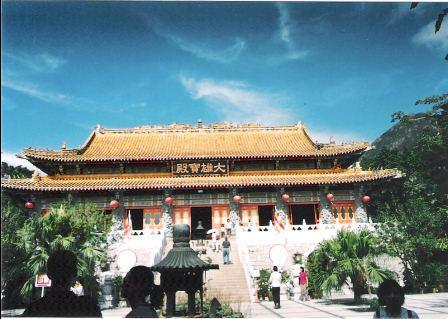 Not far away from the Giant Buddha, is the temple, Po Lin Monastery. Many Taoists like to enjoy the vegetarian meal over here. 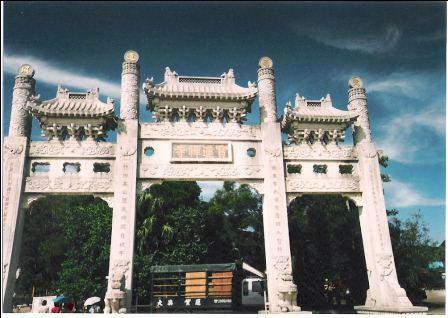 It is very well-known to all Hong Kong people. If you join any local tour, it is a must to stay here to have a vegetarian meal. Perry and I went in to try to find out where our relationship would go (we were dating back then). There are many cups filled with wooden sticks inside. You kneel in front of the Buddhas and lightly shake the cups and one of the sticks would fall out. There is a number on each stick. You go outside of the temple and somebody will give you a memo-like paper according to the stick's number. It's in old Chinese. You may find a fortune teller to explain to you what it means. I somewhat understood what it said. 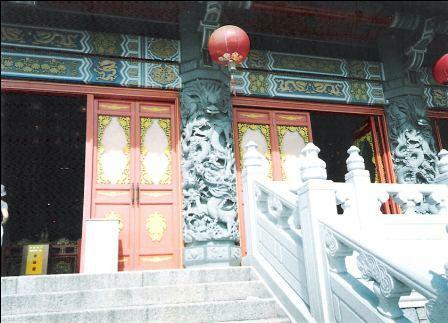 After the explanation, you would pay some money as a donation to the Po Lin Monastery. If the fortune is meant for good, keep it. Otherwise, burn it immediately. Wisdom Path is comparatively new which is not far away from the temple. 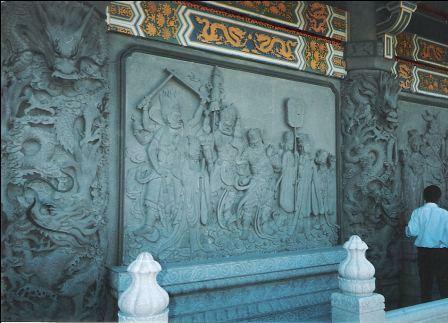 It is an outdoor replica of the centuries old Heart Sutra. We have never been here before. But from some of the pictures I saw online, it looks like some scenes that I always saw on the Hong Kong TV series. We went back to the bus station where you may buy souvenirs from the mom and pop stores. Some of them are very expensive 'cos those are the only places for you to buy stuff related to the Hong Kong Giant Buddha/Po Lin Monastery. In summer time, I strongly suggest you bring your own drink 'cos buying from these stores cost at least 2 times more than the regular supermarkets. 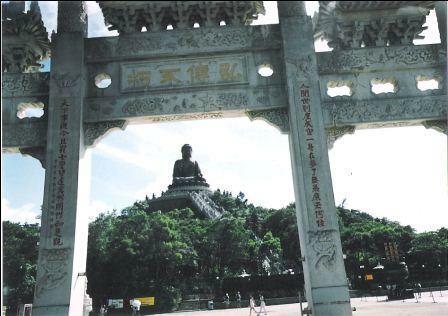 Next time when we go back to Hong Kong, we will visit the Giant Buddha/Po Lin Monastery again. Instead of taking the bus back and forth, I hope we are lucky enough that I can try out the cable car in Ngong Ping 360. 1. Central Ferry Pier 6 (MTR Hong Kong Station Exit E1. Walk through IFC mall. It is also very close to the current Star Ferry Central station to Mui Wo, then take bus 2.